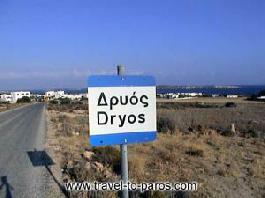 Holiday.gr - Drios, a trip to a myth! Village Drios is located on the east side of the island 25 km from Parikia. It is a graphic seaside village with rich vegetation and a lot of running waters. Although it has tourist development, it keeps the traditional colour of Cyclades islands and the sweet calmness that characterizes it. The visitor enjoys walks in the village and fills its heart with unforgettable pictures. Drios is inhabited since archaic times. In location Pirgaki, was discovered an ancient cemetery, dated to the 2nd millenium BC. The beach of Drios is ideal for those avoiding cosmopolitan beaches. It has small pebbles and dark blue waters. Highly impressive are the carved rocks where, according to the tradition, ancient navigators chained their ships. The small graphic port gives a push to the village that provides all sort of comforts to the visitors. Been to Drios ? Share your experiences!